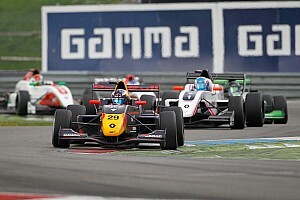 The swiss driver Louis Delétraz (Josef Kaumann racing) led the season opener of the Formula Renault 2.0 Nortern European Cup race from beginning to the end. It was a spectacular race which saw some exiting battles. Andrea Pizzitola (Manor MP Motorsport) started from second and before the first corner overtook Ukyo Sasahara (Euronova). Polesitter Louis Delétraz set the pace direct after the start. Behind him in the second chicane it was Aurélien Panis (ART Junior Team) and Roy Geerts (AVF) who touched and both were out of the race. 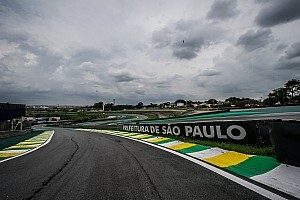 In the first three laps of the race there were a lot of battles, unfortunately not always without consequence; ten drivers did not finish the race. For second and third place the battle was between Sasahara, Pizzitola (Manor MP Motorsport) and Swiss driver Levin Amweg (ART Junior Team). 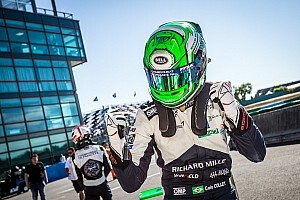 Pizzitola lost and regained his position from Amweg, who in turn could not stand the pressure from fifth placed Steijn Schothorst (Manor MP Motorsport). Amweg finished fourth. Ukyo Sasahara tried to catch Louis Delétraz but had to be satisfied with a second place. 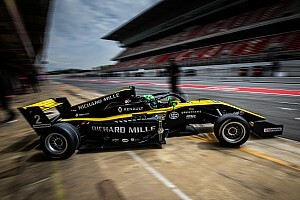 Louis, the son of the former Formula 1 driver Jean-Denis Delétraz, celebrated with a 0,8 second gap his first win in the Formula Renault 2.0 Northern European Cup. Behind Ukyo Sasahara it was Andrea Pizzitola in third place on the podium. Alex Albon (KTR) finished sixth behind Amweg and Schothorst. Seventh finished Kevin Jörg (Josef Kaufmann Racing) who will start from pole in tomorrow's second race. From 20th on the grid it was Raoul Owens (Mark Burdett Motorsport) who moved up to finish 8th. Because of technical difficulties he only did his first full laps in qualifying.